I know you might laugh or not believe me when I say this but I still can’t believe I’m a mom to the happiest ten month-old. For the longest time I did not want to have a baby or even imagine myself taking care of a little one. I was terrified of what the pregnancy would be like with my Type 1 Diabetes and how my body would deal with it. If you read my posts about my high risk pregnancy you’ll know it wasn’t easy! One day, even incredibly happy, our home felt empty, even with our puppy Gala and her hyper-activeness. I loved my life too much just like it was. I had control of everything and I also had freedom to do what I wanted with my time. I laugh when I think of all the times I justified not having a baby because it would change my career path. There was really no way to know what I was missing because I was not a mom. Having Nicolás Enrique at home now makes me realize that there was a bit of chaos missing at home. His coos, excited screams and even the crying ironically makes our home feel cozier, happier. It makes my husband and I feel that we have a bigger priority than going to work or traveling: we get to raise our son. 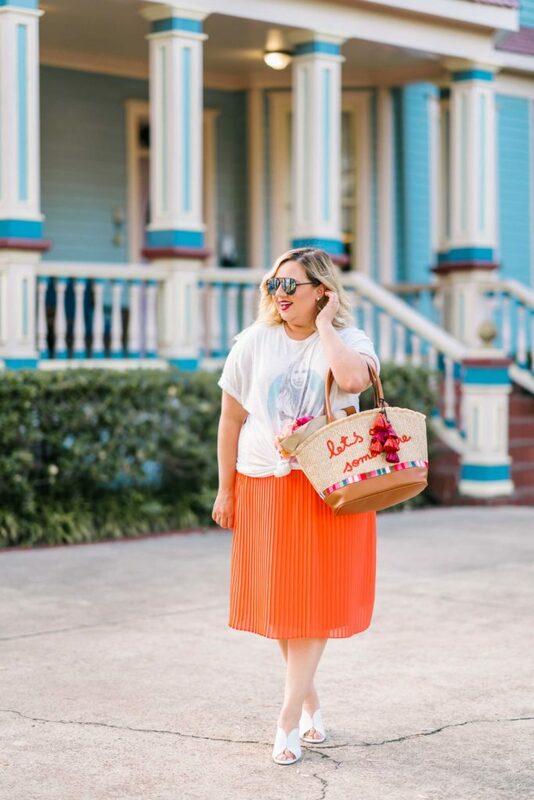 Love this orange pleated skirt! 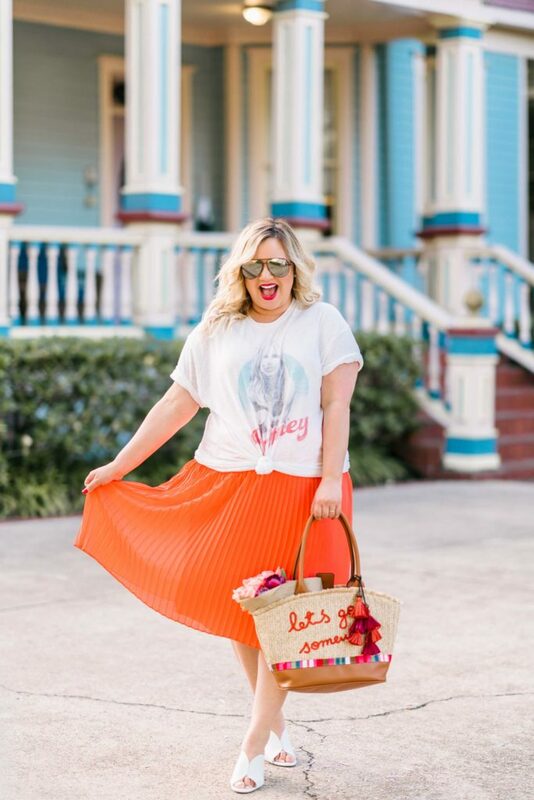 if you’re a curvy mom like me, style it with a tie front top/tee to hide the mom pooch! 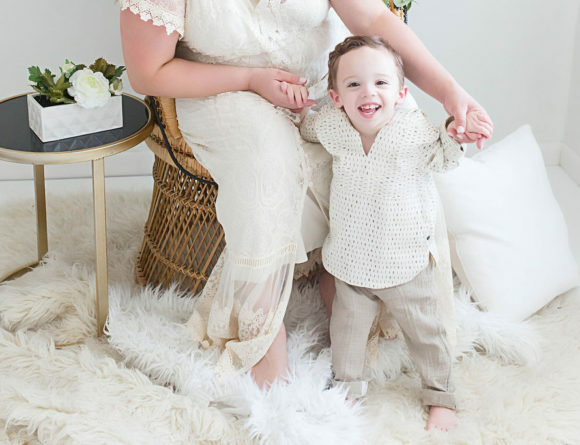 Very slowly I started embracing life at home working as a blogger and being Nicolas’s mom. It’s been the happiest and most challenging months of our lives. If I knew I was going to meet this wonderful, little person I probably would have had him sooner. Sometimes I get a lot of messages saying it’s so cool how I’ve incorporated my baby into my life and how I make motherhood look like fun. It has been way funner than I expected and I’ve enjoyed weaving Nicolás into every nook and cranny of my life. The challenge of not knowing how things will turn out when I take him to the museum or with me to get my nails done and then overcoming those fears makes me feel stronger. 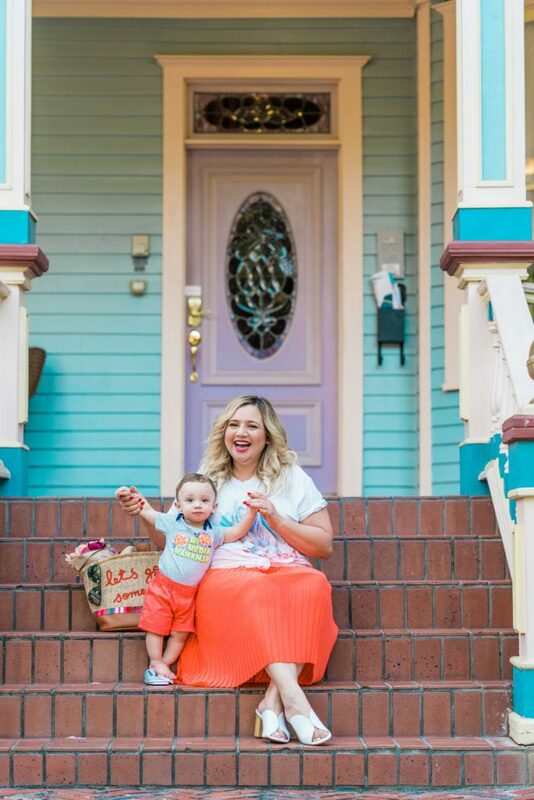 There are things that have made my short journey in motherhood a fun adventure and a less scary path and I have to share them with you! Find a group of moms that uplift you and welcome you. Most importantly we laugh about all the trivial mom blunders and make each other feel better. I can’t say enough amazing things about the strong, beautiful women I meet up with every Thursday; they inspire me and show me that being a mom and being fabulous is possible! 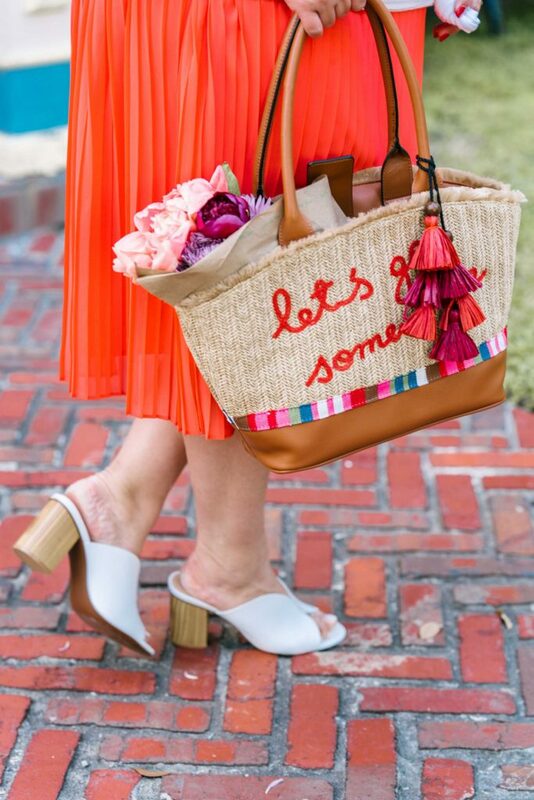 Love this straw bag under $30 and my slip on mules- summer staples that you’ll see on repeat because they’re comfy and stylish. I think it’s imperative to take time for yourself and recharge those batteries; I know it helps me with my mood to miss my hubby and baby. It’s funny because I’ll leave for an hour to do my nails and I already miss them. Without my husband I wouldn’t be able to be a mom! Duh! Miguel is 100% in on dad duties and is up for anything (although he’s still scared of bathing him). Knowing I can rely on him for everything makes being a mom easier. Thank you Miguel! I thought I’d be able to do everything by myself and not get anyone’s help. Ha! That’s so funny just writing it. More important than accepting help ask for help because it’s OK not doing everything by yourself. 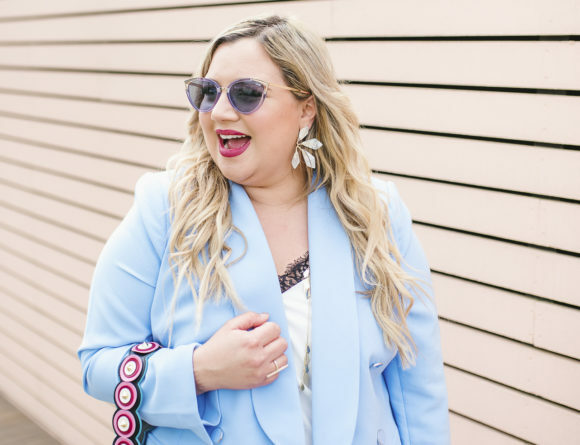 At the start of my pregnancy and when I had just had my baby I thought I was never going to dress up, take photos and blog again. Among my nausea, hard c-section recovery and mom duties I couldn’t fathom the thought of feeling fabulous again. The blog is part of me and it’s become my small business, source of creativity and it makes me feel alive and apparently I’ve made other people realize that a baby is a blessing not a curve ball in life. I’m still chasing this dream and building it. What makes you feel like yourself? One of the hardest things that I didn’t expect was how hard it was going to be to get some quality date night time with my hubby. It all becomes about the baby and it’s wonderful but the times we have been to the movies or a nice restaurant we remind ourselves of why fell in love. I miss that and I wish we could do date night more often. I never planned for my life to go the way it has and I certainly never thought I’d be a stay at home mom. I always imagined myself working at an office and dropping off my baby at grandma’s or daycare. The stigma of staying at home and “just being a mom” has changed. 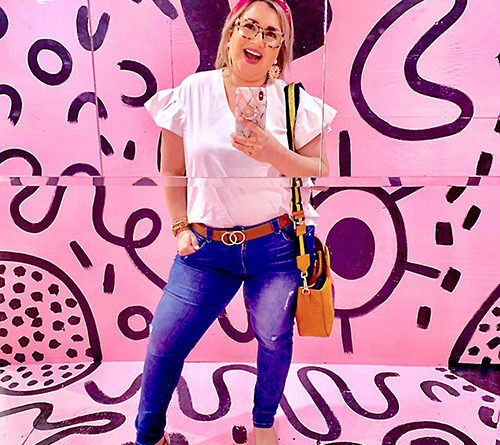 Working from home is easier with social media and the internet and it has made my life as a mom more fulfilling because I never miss anything new Nicolás discovers. I’m more disciplined with my work time too. There’s always sacrifice involved in having a family but at this stage in my life, I don’t regret scaling back on my blog posts if it means tickling Nicolás and hearing him giggle. The most important things to remember is that not having a perfect balance is OK! Having a kid is going to rock your world, filter the people that really have your back in life and make you see life more clearly. It’s also going to be messy, chaotic, unorganized but you will never experience a love like the one you have for your baby. All the little sacrifices will be worth it as long as you don’t lose yourself along the way so you can stay happy and be a great mom and wife.